Composed by LESLEY DUNCAN for Sunshine Music Ltd. If 1970’s ‘Elton John’ album had put him on the map, his follow-up LP, ‘Tumbleweed Connection’, more than consolidated Elton’s position, although its lack of a big hit single prevented it from becoming a major step forward in the U.S. However, like its eponymous predecessor, it was certified gold for sales of over half a million units, although it has undoubtedly sold well over a million copies in the two and a half decades since it first emerged. Because platinum certification was not introduced until 1976, nor multi-platinum certification until 1984, this album’s precise status has never been officially established, although it is almost certainly at least double platinum. ‘Tumbleweed Connection’ marked the point where Elton was making inroads in Britain as a serious rock artist, chiefly an album act. Released in October, 1970, it was his first UK Top 10 LP, remaining in the chart for five months (several weeks longer than the ‘Elton John’ album). If this rock (as opposed to pop) image and direction was indeed the intention, it was somewhat diluted by the release in early 1971 of ‘Your Song’ (from the previous LP) as a single, which became his first UK chart 45, although confusingly it was not included on his latest and current album. Nearly all the songs on the new LP, which was again recorded at Trident Studio and produced by Gus Dudgeon, seemed to reflect Bernie Taupin’s preoccupation and fascination with the American West, outlaws, sheriffs, the great outdoors, etc. Two of the ten songs on the album included the word ‘gun’ in their title, and the sepia colour which dominated the lavish sleeve, a “fold-out” with a 12 page “book” containing lyrics, musician credits and drawings (of a train, a river boat, soldiers, etc.) and rich brown photographs, reinforced the impression created by such song titles as ‘Country Comfort’, ‘Burn Down The Mission’, and ‘Ballad Of A Well Known Gun’. Despite this obvious expense and care, not one song on this clearly superb LP has ever been a hit single, even for Elton himself, although ‘Ballad Of A Well Known Gun’, which in the version here features Caleb Quaye’s guitar punctuation and backing vocals by a six-strong choir including Dusty Springfield, Lesley Duncan, Madeleine Bell and Tony Burrows, was covered by James Taylor’s younger sister, Kate, and included on her only US chart LP. Kate Taylor (who clearly didn’t share her big brother’s self-confidence as a songwriter) also covered ‘Country Comfort’ on the same LP, and the latter song was also covered by a genuine country artist, Juice Newton, who included her version on her first hit album in 1981. However, it is probably best known as a cover version because Rod Stewart included it on his second LP, ‘Gasoline Alley’. Elton’s original version, which sounds somewhat like bluegrass or country/rock, features fiddle (by veteran jazzman Johnny Van Derek), pedal steel guitar (Gordon Huntley of Matthews Southern Comfort) and harmonica from Ian Duck, the vocalist and front man of Hookfoot, Elton’s DJM label-mates, who all – guitarist Caleb Quaye, drummer Roger Pope, bassman Dave Glover and Ian Duck – appear on the album. The final track here, ‘Burn Down The Mission’, which became a stand-out of Elton’s live shows at the time, is remarkably reminiscent in form to such latterday Gothic epics by Jim Steinman as ‘Bat Out Of Hell’, although it bears little lyrical relation to the Meat Loaf signature tune, which was not written until some years later than ‘Mission’, which was covered by Phil Collins on ‘Two Rooms’, the 1991 tribute album of Elton & Bernie’s songs. On the same all-star collection, Sting covered ‘Come Down In Time’, which was one of the apparent exceptions to the Western concept of the album, a modern romantic song which in Elton’s original version, uses harp (as in Harpo Marx) played by the unforgettably named Skaila Kanga, and oboe. The song was also recorded by both Judy Collins and Al Kooper, two notable American artists of the 1970s who were critical favourites. Two of the songs on ‘Tumbleweed’ dwell on slightly morbid subjects, but the compositional quality in both cases is inspired. ‘Where To Now, St. Peter?’ addresses the agnostic dilemma of whether the final destination is heaven or hell, and is one of Taupin’s most astute early lyrics, and the more resigned ‘Talking Old Soldiers’ could have been written by Randy Newman. The latter has a dedication to ‘David’, who is believed to be David Ackles, the American singer/songwriter whose third LP, ‘American Gothic’, would be produced by Bernie Taupin. David Ackles was the opening act for Elton’s first live appearances in the US at the famous Troubadour club in Los Angeles in August, 1970, which is where America began its continuing admiration and love for Elton and his work. An early recording of the title song of Elton’s next album, ‘Madman Across The Water’, was undertaken during the sessions which produced ‘Tumbleweed Connection’, and featured Mick Ronson on guitar rather than Chris Spedding – Ronson came to prominence around this time (early 1970s) as David Bowie’s right hand man in The Spiders From Mars, the ‘Ziggy Stardust’ band. Another acoustic version featuring folk guitarist Michael Chapman has also been mentioned, but the recording which includes Ronson was only released officially in 1991 on the ‘Rare Masters’ compilation. 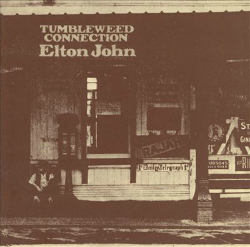 Elton has said of ‘Tumbleweed Connection’: “Lyrically and melodically, that’s probably one of our most perfect albums. I don’t think there’s any song on there that doesn’t melodically fit the lyric”. Bernie Taupin recalled: “Everybody thinks that I was influenced by Americana and by seeing America first hand, but we wrote and recorded the album before we’d even been to the States. It was totally influenced by The Band’s album, ‘Music From Big Pink’, and Robbie Robertson’s songs. I’ve always loved Americana, and I loved American Westerns. I’ve always said that ‘El Paso’ was the song that made me want to write songs, it was the perfect meshing of melody and storyline, and I thought that here was something that married rhythms and the written word perfectly”. ‘Amoreena’, a regretful love song on which Elton was backed for the first time on record by his longtime rhythm section of Dee Murray and Nigel Olsson, is also the name of Elton’s God-daughter, and ‘Love Story’ is an “outside” song, written by Lesley Duncan, who plays acoustic guitar and sings with Elton. Both the song and the completed track were exceptional (even if the song wasn’t a John/Taupin original), which illustrates the way that Elton has often supported the efforts of talented friends… ‘Son Of Your Father’ (completely unrelated to the similarly titled Chickory Tip hit of two years later) is a highly cinematic black tale of two brothers, one of whom is blind and has a hook instead of a hand, and like several tracks here, is sufficiently vivid to perhaps one day form the basis of a movie script. This almost conceptual album may have attracted the attention of The Eagles, who treated similar subject matter totally conceptually a year or two later on their ‘Desperado’ album. All the tapes used to create these new masters are the original mixes. However, due to the fact that many of the tapes are at least 25 years old, they have “softened up” to varying degrees. So, the sound has been passed through the most up to date digital processing equipment, at 20 Bit Resolution; namely The Sadie Digital System and Prism Super Noise Sharper. The effect is purely to “enhance” rather than “colour” the sound. As the original producer, I would have used this equipment at the time, had it been available for mastering. The very nature of analog recordings being transferred to vinyl demanded major compromises. With the benefits of digital sound these constraints are removed, and the recordings can be heard much closer to the reproduction we had originally intended. 314-528 155-2 © 1995 This Record Company Ltd. Printed in U.S.A. Rocket Records, Manufactured and Marketed by Island Records, Inc. This Compilation (P) © 1995 This Record Company Ltd.